PERFECT CHIN: BRING OUT YOUR BEST PROFILE! The double chin is a family heirloom that we could do without! It adds a burden to the face, destroys the profile and has an overall deterrent effect. Although it usually appears when we're overweight, it can also come to light without being overweight and then ... there is no point in losing weight, the double chin will always be there! The principal active ingredient in PERFECT CHIN is glaucine, an alkaloïd extracted from Glaucium plant. 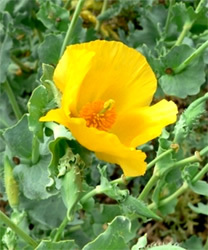 This plant grows on the sands of the Mediterranean and Atlantic coasts. This natural compound helps address the problem of unsightly sagging skin. In addition, PERFECT CHIN contains Argan Oil.